Located just 3 hrs N.W. of Boise, the Seven Devils Lodge has a rich history for a great western experience. Offering trail rides or riding with the real working cowboys of the OX Ranch . Located on 18,000 acres, 7D has some of the best elk, deer, and bear hunting in the state. With some great stream fishing and stocked ponds for the float tubers, 7D has some of the best outdoor adventures to experience. 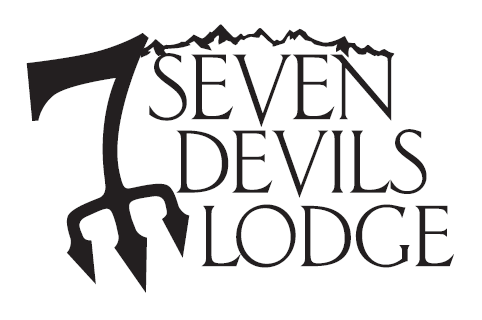 Check out the website at sevendevilslodge.com for more information, beautiful pictures and video of what's waiting for you at Seven Devils Lodge. Mission Statement: To ensure our clients enjoy the thrill of a fair chase hunt and Adventures Worldwide. Whether its a South African Safari or a Worldwide Fishing trip you're interested, contact Joe Barrio at Worldwide Adventures today for your next trip. Although the snowfall was lighter than usual this year there was still outstanding powder to be had and some great rides. Several groups from the Northwest came in to visit for the first time, while other guests revisited from years past. They all agreed, 7 Devils is the place to be. New for next year we will be working on 7D's Snow Cast. This will give a weekly report of conditions here at the lodge and up on the mountain. We invite you to experience the western way of life where the sun dictates your day, the chime of the dinner bell is serenity's only interruption, and your children trade television for a new found appreciation of animals and outdoor adventure. Hearty western cuisine, expansive viewing decks, a steaming hot tub, and loads of outdoor activities await you. Nestled on 18,000 acres, south of the Seven Devils Mountains, our 5,000 square foot lodge offers six spacious bedroom suites with views of the mountains that are unsurpassed. Satellite TV and wireless internet provide a few modern touches, but rest assured, once you're up here, you'll quickly forget about the bustle of technology as you settle into the thrill of mountain life. If you're in the market for an outdoor adventure or a true western experience we truly can offer it all. The ranch has horseback trail rides to riding along with full time working cowboys, miles of snowmobiling, ATV trails, and countless other recreational opportunities from hiking to photography. You won't be disappointed! The lodge is also well suited for small retreats (groups of 10-15) to conduct business meetings, quilting or scrapbooking sessions, Dutch oven cooking, book clubs, oil painting, or just about any activity you can imagine. The Seven Devils Ranch and Guest Lodge is truly a one of a kind mountain getaway.